While celebrating Child Rights Week 67 children, aged 6 to 18 years, from the Residential Care Program (RCP) took on the onus of forming a children’s committee at their center. After a thought-provoking discussion children from each center elected their committee leaders for education, health, discipline, recreation, and environment and a president. The process has sought participation and involvement of children, and brought a sense of ownership among the children in the functioning and management of their center. RCP is a comprehensive residential care program that aims at restoring a wholesome childhood to children in crisis that are orphaned, and vulnerable due to HIV/AIDS. It seeks to facilitate opportunities for the healthy growth and development of children until they are 21, reintegrated with their families, extended family, or start living on their own. 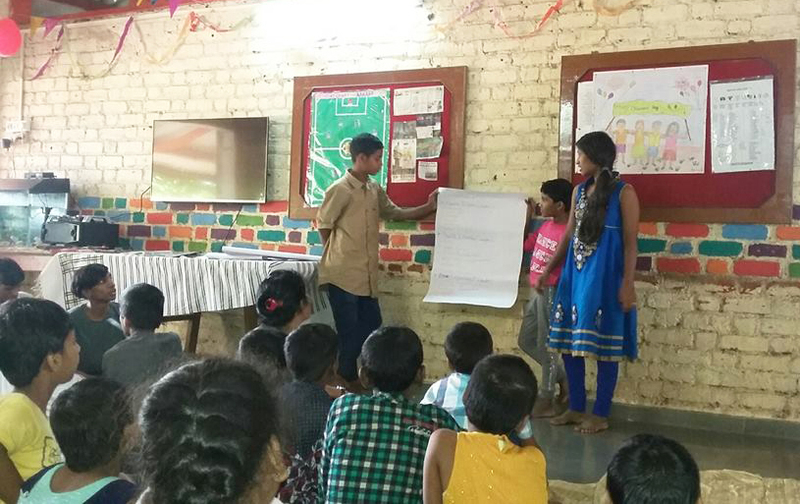 Children across the RCP deliberated upon the committees being formed in their centers during the two-day long camp organised at Aakaar Centre in Lonavala. Children discussed the various committees each center should have, and reached a consensus on having education, health, discipline, recreation and an environment committee with one president across these committees. Moreover, children discussed the qualities each committee leader should demonstrate which will determine the selection of the child for that leadership position. Furthermore the various roles and responsibilities of the Committees and the corrective measures when norms decided are not adhered to were also discussed and firmed up. The camp ended with children celebrating Children’s Day with the Child Welfare Committee Members of Pune. CWC member and motivational speaker Adv. Shashikant Sawarkar gave an inspiring speech to the children on careers, and developing one’s personal and professional goals. The CWC members shared, “It was a cheerful moment for all of us to join the Children’s Day Celebration at Aakaar. We appreciate the gathering of all children from across the centers as well as the cleanliness, facilities, and management of the Aakaar Center”.